Graduation Rates of CTE Students research points to factors such as socioeconomic status that limit female studentsâ&#x20AC;&#x2122; decisions to enroll or concentrate in non-traditional Pathways (Toglia, 2013). 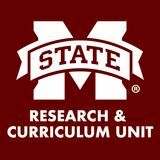 Pertaining to the impact of race on graduation rates, Yates (2008) cited various studies pointing to an alarmingly high risk of not graduating among secondary Black, Hispanic, and other racial minority students in 2006. Conservative estimates concluded that nationwide in 2006 Black and Hispanic students did not graduate at rates of approximately 11% and 22%, respectively, compared to 6% for White students. Yates (2008) pointed out that Black students were also more likely than White students to be placed in special education programs, lowering Black studentsâ&#x20AC;&#x2122; chances of graduating at all or with traditional degrees. States with large Hispanic and immigrant student populations suffer an even greater disadvantage: Although data for immigrant students were available for only 2 years (2002-2003), their attrition rates were significantly higher than all other groups, at 40%. Using cohort analysis procedures rather than annual data, some studies (Johnson, 2005) have reported that more than half of Hispanic students fail to complete high school. These are, of course, critical and tragic evidences of a failure to meet the educational needs of non-White, poor, and immigrant students. Moreover, these data indicate a crisis for the nation when considered in the context of the changing demography. 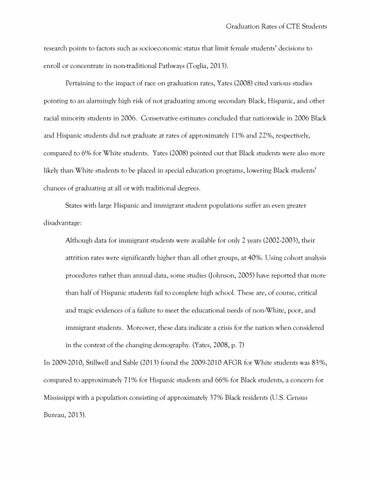 (Yates, 2008, p. 7) In 2009-2010, Stillwell and Sable (2013) found the 2009-2010 AFGR for White students was 83%, compared to approximately 71% for Hispanic students and 66% for Black students, a concern for Mississippi with a population consisting of approximately 37% Black residents (U.S. Census Bureau, 2013).